The Waterfall Country Village Residence exudes a passion for family and entertainment offering large open-spaces and functionality. Expert TOP CENTRE PROPERTIES GROUP fulfilled their client's needs by creating their ideal home that caters for guest entertainment while paying attention to elegance. This beautiful home has ample parking space for the residents and their guests as well as wide open spaces for loads of entertainment. Whether you're gathering the guys for a game of rugby and a braai or looking to entertain in a more formal, yet opulent setting, then the home is the perfect example. This opulent Midrand residence is not shy on space and features a triple garage parking to shelter vehicles from the changing weather patterns of Gauteng. With the extra outer parking in the driveway, guests can enjoy peace of mind that their vehicles are secure on the property. 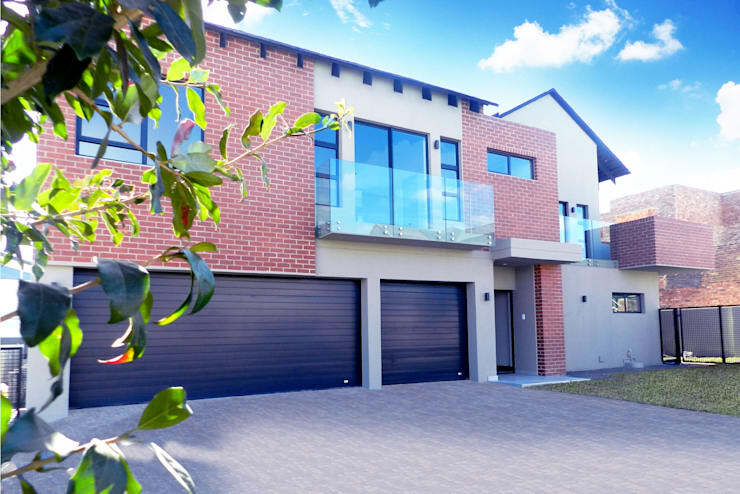 The red face brick walls exude robustness and a charming modern structure. The double volume ceiling gives way for an artistic flair with the touch of these beautiful cascading lights. 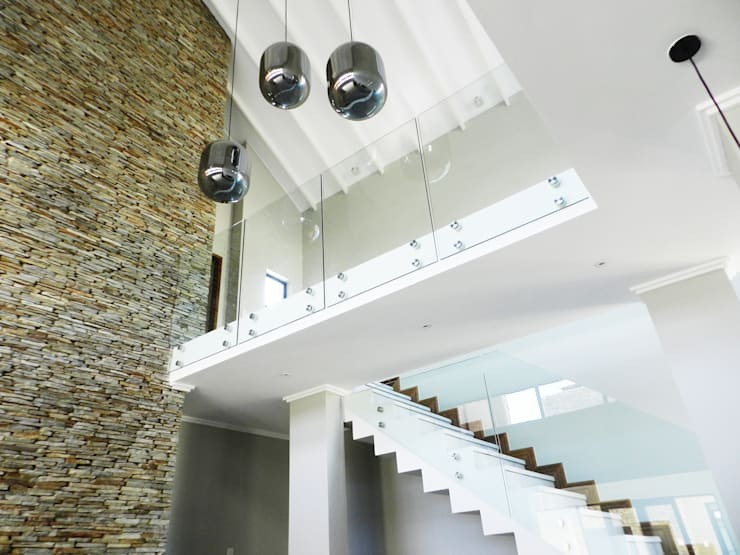 The structure of the staircase also incorporates natural sunlight opening the current space even more. The Waterfall Country Village Residence is truly a home of chic interior design perfectly executed by architects that are exceptional at their job. 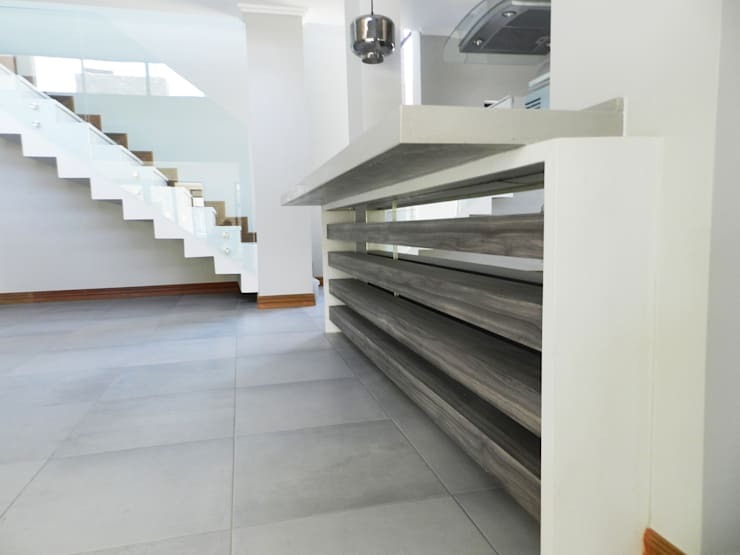 When wall cladding is done right, you can enjoy a timeless, modern contemporary effect that creates the perfect balance. 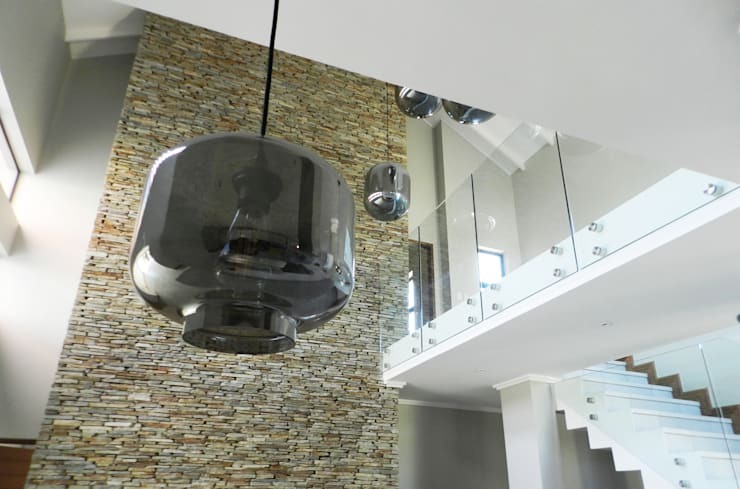 The wall cladding used in this Johannesburg construction home fits well with the tall ceilings. The high-level windows draw light into this open space and set the perfect ambiance. This fabulous kitchen and entertainment area leads out towards the swimming pool. The property enjoys the benefits of entertainment even on those rainy days, hence is suitable for summer parties and winter get-togethers. 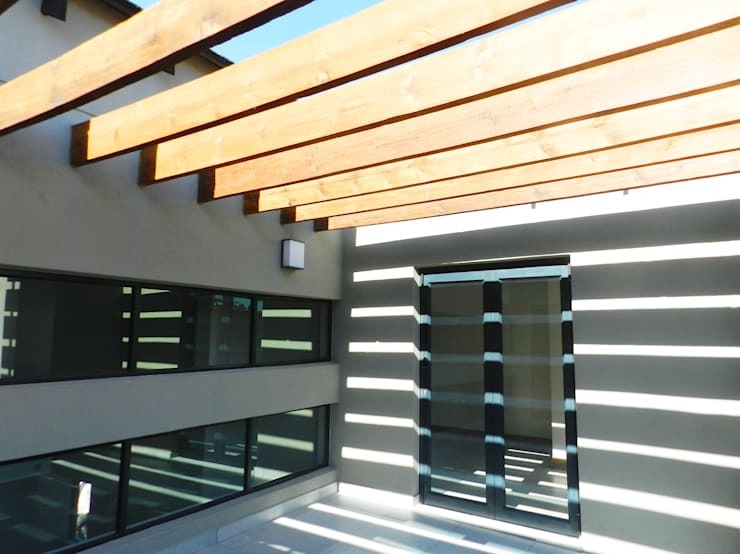 Property designers again blend neutral colours, and natural lighting for low maintenance and energy saving solutions. There is something exquisite and beautiful about a grayscale bathroom. 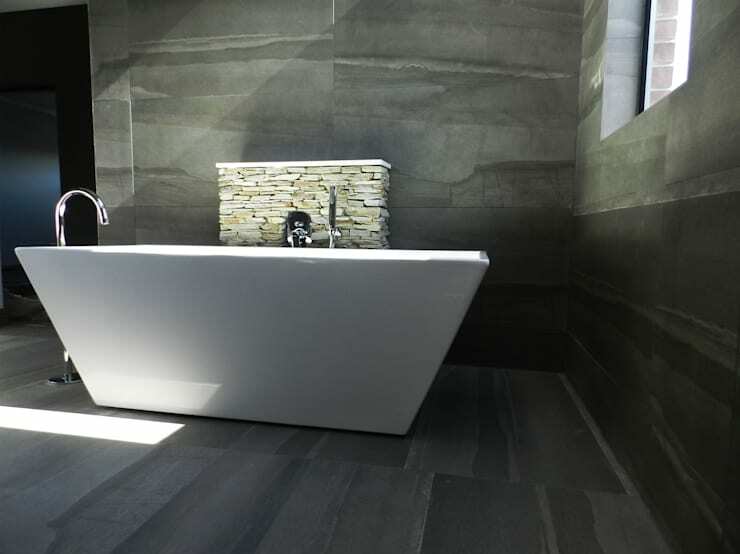 Property development pros in Sandton Johannesburg created a simple, yet chic neutral grayscale bathroom with a freestanding bathtub and a natural stone wall cladding centre detail. This stylish bathroom is also light on maintenance and oozes modern day glamour. This outdoor space takes advantage of the natural light and makes it not only showcase a modern look but also a beautiful setting in this spacious area. You can't go wrong with just the right blend of natural colours within your home. 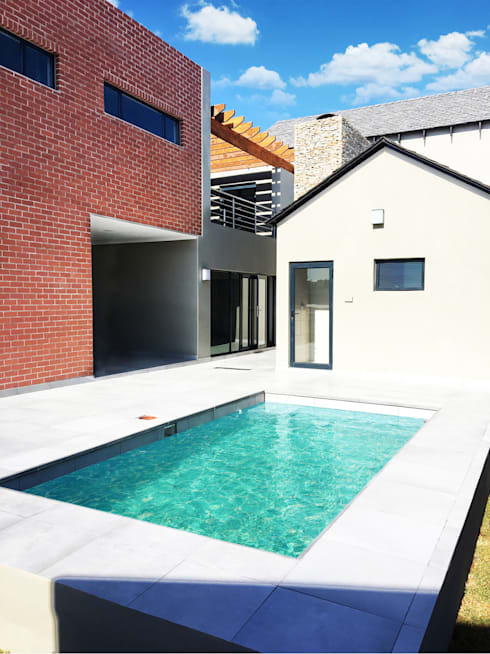 The Waterfall Country Village Residence in Midrand stays true to harnessing natural elements when designers blend red face brick, stone and concrete textures throughout the outdoor entertainment pool area. The pool is a modest splash type that allows for that refreshing dip on a hot summer's day that is just enough too cool off without wasting H2O.